Harry Houdini (born Erik Weisz, later Ehrich Weiss or Harry Weiss; March 24, 1874 – October 31, 1926) was a Hungarian-American illusionist and stunt performer, noted for his sensational escape acts. He first attracted notice in vaudeville in the United States and then as “Harry Handcuff Houdini” on a tour of Europe, where he challenged police forces to keep him locked up. Soon he extended his repertoire to include chains, ropes slung from skyscrapers, straitjackets under water, and having to escape from and hold his breath inside a sealed milk can. In 1904, thousands watched as he tried to escape from special handcuffs commissioned by London’s Daily Mirror, keeping them in suspense for an hour. Another stunt saw him buried alive and only just able to claw himself to the surface, emerging in a state of near-breakdown. 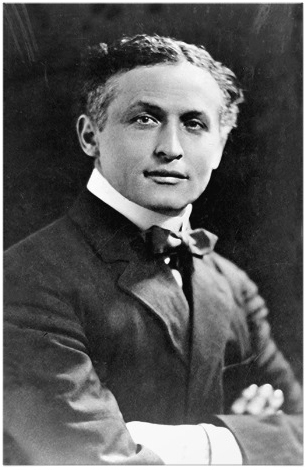 While many suspected that these escapes were faked, Houdini presented himself as the scourge of fake spiritualists. As President of the Society of American Magicians, he was keen to uphold professional standards and expose fraudulent artists. He was also quick to sue anyone who pirated his escape stunts. Siblings: Theodore Hardeen, Herman M., Leopold D., Gottfried William, Carrie Gladys, Nathan J.